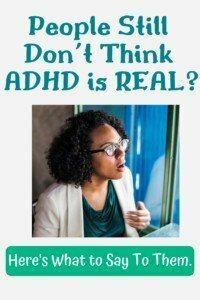 Is ADHD Real? Here is the Honest Answer. When I googled “Is ADHD real” the first hit that popped up was an article on what I thought was a trust website by someone who’s supposed to be knowledgeable spouting off really bad information. It really bothered me. If our doctors and therapists are so misinformed about ADHD, how many people have been harmed, fallen through the cracks, and continue to believe the worst about themselves because they have ADHD but don’t know it? And think they are too lazy or stupid to get anywhere in life. In true ADHD fashion, the injustice of it all made me mad. After stewing about it for a bit, I decided I need to write a real answer. An honest and informed answer to the question. ADHD is a neurological disorder that causes difficulty in areas of executive function like planning, organization, attention and memory, etc… The brain of a person with ADHD works differently than the brain of the majority of people. Most people can relate to some of the symptoms of ADHD some of the time (which might be why they think it’s not really a disorder). Everyone has misplaced their keys. Everyone finds it harder to do something they find boring. Most people have had an experience where they had a hard time concentrating or paying attention. For most people, this isn’t a daily, hourly, minute-ly (is that a word? I don’t think so) thing. For most people, this happens sporadically and may be related to a poor night’s sleep, having extra stress, or not eating enough that day. For an ADHDer, it’s almost constant. And no amount of consequence changes the inevitable–not because we are stupid or don’t care, but because our brain is working against us. How do you know ADHD is real? I’m so glad you asked! 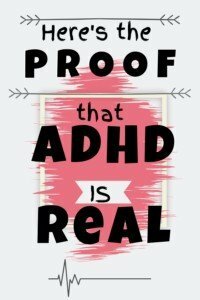 In the last couple decades, so much research has been done to better understand ADHD and all of that research really helps us to better clarify that it is indeed REAL. Through genetic studies with identical twins and high resolution scans of the brain looking at both the physical structure of the brain as well as brain waves, we’ve been able to see the evidence of ADHD as a neurological condition. Twin studies involving one child adopted to another family and the other kept with the family of origin have been able to show us that ADHD is highly correlated with the family of origin and shows no correlation with the adoptive family. This presents pretty strong evidence that ADHD has nothing to do with your environment or the way you were parented. Imaging (like MRI scans) has shown that the brain of an ADHDer is smaller in certain key areas (like the frontal lobes) that correspond with the deficits observed. Brain wave scans (like encephalograms) have shown abnormal activity in the frontal lobe region of ADHDers. The frontal lobe is largely responsible for things like planning, organization, logical and socially appropriate behavior, consciousness of the consequence of behavior, attention, self control, among other things. A deficit in the frontal lobe region corresponds with all of the symptoms of ADHD. We have as much evidence for the existence of ADHD as we do for the existence of Alzheimers. Isn’t it interesting that we are still needing to overcome a lack of belief in one but not the other? Did you know that people used to believe that bad parenting was the reason for schizophrenia? Thankfully, most have come to their senses on that one and realize that schizophrenia is a neurological condition. For some reason, society goes through a cycle of disorders they want to blame on parenting. There are negative effects of unhealthy parenting patterns, but ADHD isn’t one of them. Low self esteem, being overly critical or overly focused on the self, distrusting everyoneone and difficulty having relationships for example. But ADHD isn’t one of them. Again, ADHD is a neurological condition. The lack of self regulation has nothing to do with what they person has experienced–good or bad. Its the way their brain is wired. ADHD child could have the “perfect” parents and still have ADHD just like a child with schizophrenia or cancer can have the “perfect” parents and still struggle with schizophrenia or cancer. If ADHD is the result of a neurological condition (which it is) that causes deficits in the area of the brain that is responsible for self control and understanding consequences of behavior and being logical, it’s absurd to think that “bad parenting” is to blame. How does bad parenting result in neurological abnormalities barring physical abuse? With this argument, you can prove that pharmaceutical companies make money off of ADHD (like they do allergies, migraines, and a host of other issues). What you can’t prove (any more so than you can prove it for diabetes), is that the disorder has been made up by them in order to get that money. And the fact that people want to use this argument for ADHD but would also find it ludicrous to say the same about taking a painkiller for a headache is a double standard that reveals the stigma that still exists over ADHD (and most other psychiatric disorders). Besides, Big Pharma might like to make money but so does your insurance company. If there was any way insurance could get out of paying for something, it seems to me like they would. Wouldn’t they be all over that argument just to keep from spending money on testing, therapy, medication, etc….for ADHD? So everyone has a neurological disorder? That’s strange. I’m assuming what is meant here is that everyone can relate to ADHD symptoms in some way. That’s probably true. Everyone has lost their keys at some point. Everyone has zoned out on something important. Everyone has felt restless. That’s not ADHD. ADHD is a daily struggle with those symptoms. A daily struggle that a person has little to no control over without help. It’s struggling with these symptoms to the extent that it causes major consequences in your life. To the extent that a person often feels shame, exhaustion, and sheer defeat because they keep trying to control their attention but it’s gone well before they even realize it’s gone. It’s daily. It’s minute to minute. It’s not being able to hold down a conversation because 50,000 thoughts are trying to interfere while you’re talking. The closest a person without ADHD may be able to relate is to think of the worst day. One where you’ve had a week of 2 hours of sleep a night, running on almost no food, and you aren’t sure you’re going to be able to pay your bills because the money just isn’t there. Then try to pay attention to hours of lecture with a monotonous speaker talking about the least interesting topic you can think of. Now every day is like that and no matter how interesting or how important it is to focus or the consequences of not, you’re stuck in that lecture hall just trying to make it through. That’s not to say we think everything we can’t pay attention to is boring, only that neurotypicals might be able to better understand if they feel it in that context. That’s ADHD. And others might be able to relate on their worst days but they get to feel normal most of the time. We don’t… because we have ADHD. There is no doubt that childhood trauma can mimic ADHD symptoms. Kids may show hyperactivity from internal distress over what they’ve experienced and the racing thoughts and acting out are also common in PTSD. Along with impulsivity and lack of focus. On the surface, they can look the same. AND, a kid with childhood trauma can have ADHD on top of that. That’s why it’s important to work with a professional that is familiar with both. BUT just because they look similar, doesn’t mean they are one and the same. PTSD and Bipolar Disorder can look similar, too, but they are different. Not every child with a diagnosis of ADHD has had childhood trauma and assuming they have can be a dangerous game. What happens if you assume they have trauma and they tell you they don’t? To continue to hold this belief means you have to assume they are lying to you. That can really cause friction in a relationship and can be really frustrating to the ADHDer that starts re-evaluating everything she’s ever known trying to figure out if she missed something, wasn’t paying attention, or blocked it out. OR she knows none of that is true but feels like she has to wall that part of herself off from you because you can’t accept her for who she is and what she tells you. On top of this, there is no proof that ADHD is really just childhood trauma and plenty of proof that both ADHD and PTSD are real. Real and DIFFERENT. ADHD is a neurological disorder. PTSD is the result of painful and terrifying experiences that human beings shouldn’t be subjected to (but unfortunately are). This one I find particularly interesting. By “founder” of ADHD, I assume they mean the first person who made a large contribution to the research efforts on ADHD. I’m always suspicious of famed “death bed” confessions. In this case, it turns out I’m right. Typically, this argument is describing Dr. Leon Eisenberg but calling him the “founder” “father” or “inventor” of ADHD is problematic. He contributed to research on both ADHD and Autism in a big way (circa 1950) but knowledge of ADHD didn’t start with him. What Dr. Eisenberg actually said was that he believed the genetic predisposition of ADHD was overestimated. That’s a far cry from saying he made the whole thing up. And here we are, this many years later, with a LOT more research showing that actually, the genetic predisposition is pretty solid. It’s true that ADHD is overdiagnosed in little boys. It’s true that sometimes they are misdiagnosed and sometimes they are diagnosed when it is a deficit in the functions of the family. That is true for just about any disorder (and many diseases, too). That’s not an indication that the entire disorder is made up, only that screening practices need to be more rigorous and accurate. In other words, say no to conspiracies. That’s my goal. To stop the ignorance because misinformation like those listed above hurt us. They prevent us from getting life changing treatment. The keep us ashamed of ourselves and frustrated that no amount of trying seems to be enough. ADHD is highly treatable but most people with ADHD are still undiagnosed, in part, because of the misinformation and the stigma that prevents people from getting the care they need. Start Widespread Correct Information distribution about ADHD…in other words, SHARE THIS POST! Do you have a story that relates? People need to hear how important it is that we get an accurate diagnosis and the harm that it causes us when we are fed inaccuracies. I’d love to read your stories in the comments. I just happened by your blog via Pinterest, I was browsing decorating ideas instead of doing the dishes and laundry .. Yes, I have ADHD big time.. I was finally diagnosed in my 50’s (I am now 63).. I was relieved at the time because I finally had an reason/excuse for me being, me.. My ADHD has given me incredible creativity that I would never want to give up, but the rest of it has been a struggle.. and it gets worse for post menopausal women. I happened to mention my ADHD to a new friend ( I’m not the least bit shy about it ) and was blown away when she said “Oh that’s just something society made up”. As you can imagine … I had to set her straight.. That’s like a guy telling a woman in labor that her pain isn’t real. Thank you for putting yourself out there helping others recognize and understand what ADHD is all about. I really enjoy reading your posts. Grrrrrr, that “something society made up” thing gets me every time. I’m glad you set her straight! You are absolutely right, it IS like telling a woman that labor pains are all in her head. I’m so happy to help! Finding out about my ADHD was such a helpful thing and I’m glad to get to help other women figure it out for themselves as well. Good luck to you!